Bearing the name of the world’s finest real estate group, Trump Organization, Trump Towers is a recently launched ultra-luxurious development in The Millennium City. This is the latest landmark housing development in Delhi NCR that is sure to acquire the Gurgaon real estate. The beautifully planned marvel is planned on a 60-acre prime land located on the Gold Extension Road. With a history of developing the world-renowned projects across the world, there is no match to the standard of quality and craftsmanship Trump offers. The organization creates architectural landmarks that surpass the artistic expectations of the investors and buyers. This level of quality, beauty and attention to every single detail is always demanded in every project offered by the group. Trump Towers in Delhi NCR is the 4th project by the organization after making its presence in Pune, Mumbai and Kolkata. The Delhi NCR project by Trump Organization will be developed by top realty brands M3M India and Tribeca Developers. They will develop 258 luxury flats in the township under the brand name of Trump. The stunning architecture, super luxurious facilities and superb interior options are what set Trump Tower Gurgaon project apart. The iconic structures at the project are planned in signature style of all Trump projects with the glass facades along with sleek lines and an imposing form. The apartments are configured as 3 and 4 BHK luxury units spanning an area ranging between 3500 sq. ft. to 6000 sq. ft. The twin tower project brings the premium living opportunities for the home-lovers in India. Looking for a classy and luxurious living? 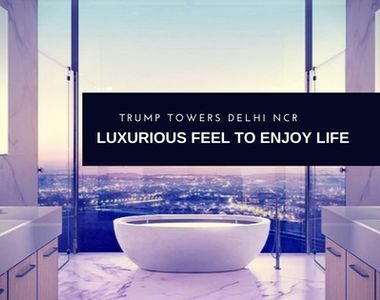 Book your dream home at Trump’s latest development in NCR. The homebuyers will love these gold property apartments planned in 2 high-rise towers brilliantly with super-luxurious features. Apart from this, the residential complex comes with all the green-living facilities where you will have a blissful experience of the surroundings. The iconic twin towers will be rising over 600 Ft. that will be amongst the tallest towers touching the skyline of NCR. 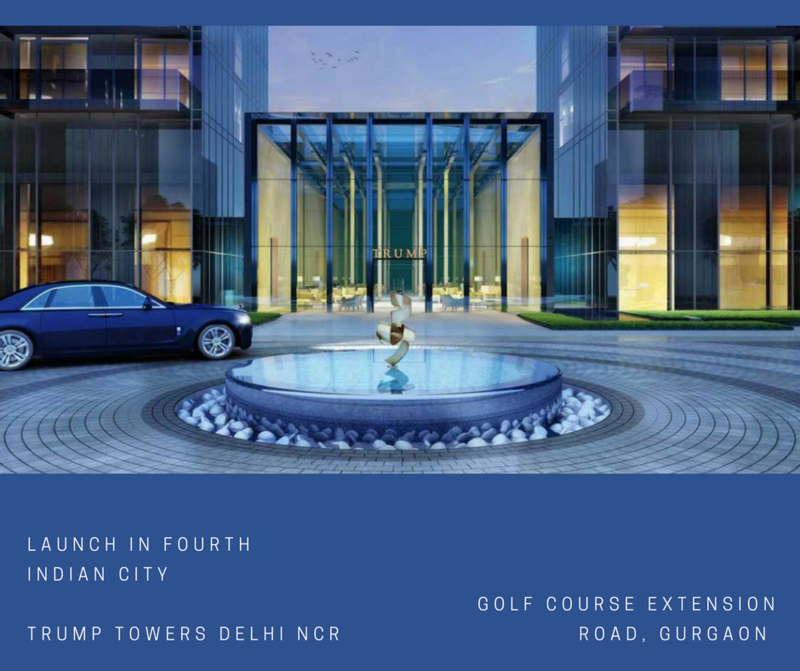 Strategically located in Gurgaon on Golf Course Extension Road, the location offers seamless connectivity to anywhere in Delhi NCR to the residents. The well-developed transportation system ensures the smooth accessibility to all the surrounding areas. Further, the metro railway simplifies the connectivity of sector 65 to several other locations in Gurgaon and other areas in NCR. Gurgaon is also emerging as an important commercial zone of India where the residents will also enjoy huge employment opportunities. The hassle-free navigation throughout the city from the project location ensures that you will reach at any important place quickly. 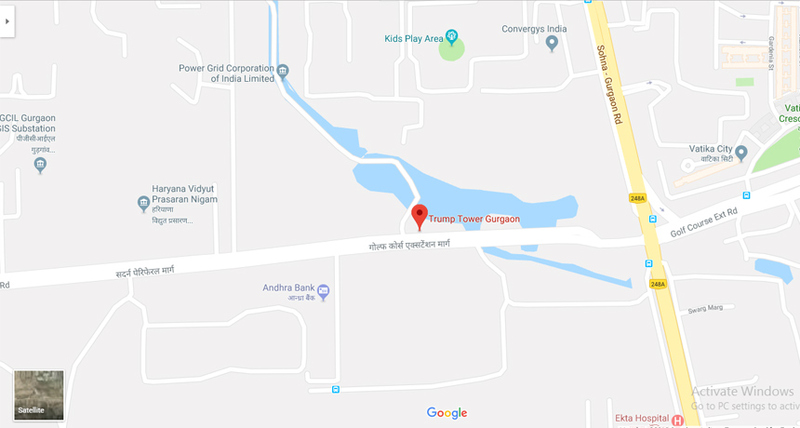 NH-8, Airport and South Delhi can also be reached in quick time from Trump Towers Golf Course Road project. All the important business hubs, shopping malls and other entertainment zones are also located close to the estate. The social infrastructure is well-developed and making the life of residents more comfortable. The important hospitals located in this area include Medanta, and Artemis. Every room of the super-luxurious and premium apartments is featuring floor-to-ceiling windows, flooding the apartments with natural light and cross-ventilation. You will also love watching the spectacular views of the surroundings and the city adjoining the 9-hole Golf Course and the Aravalis range. Another luxurious feature of Trump Towers Gurgaon is that, each residence is having a private elevator that opens in the awe-inspiring private entry and offers the ultimate privacy to the inhabitant. One third of the apartments will boats over 22 ft. double height living and will enjoy the duplex penthouse feel. This is one of the latest and largest Trump Project to date in India. From the very first day of its launch, investors and homebuyers from all across the country are showing their interest in this property. A number of units has already been booked and if you are also interested in this property, book your home now as the prices are increasing very fast. Trump Towers Delhi NCR price ranges between 4.75 crores to 8.16 crores, varying as per apartment area and configuration. Multiple payment options are available for the investors including construction linked plan, possession linked plan and subvention payment plan that you can choose as per your convenience. World's most recognized address and India's 4th Trump Towers project offering stunning architecture, beautiful interior options and lavish amenity spaces. All apartment will have 1 family lounge and 1 private lounge in Master bedroom. The price starts from 5.2 cr. and size ranges between 3500 - 6000 sq.ft.